This situation room will be developed by a pioneering collective intelligence system that is creating new software, user interfaces, and software linkages that will connect networks of outstanding experts around the world. The initial expert groups being formed now are: climate science, energy, green technology, adaptation, mitigation, and integration of sustainable development and climate change. Mohan Munasinghe, Vice Chair of the IPCC, co-winner of the 2007 Nobel Peace Prize is the advisory chair for climate science and Paul Werbos, US National Science Foundation on loan to the US Senate is the advisory chair for Energy. We define collective intelligence as “an emergent property from synergies among data/info/knowledge, software/hardware, and experts that continually learns from feedback to produce (nearly) just-in-time knowledge for better decisions than these elements acting alone.” An example of a collective intelligence for energy is the GENIS model as described at http://www.millennium-project.org/millennium/GENIS.pdf. 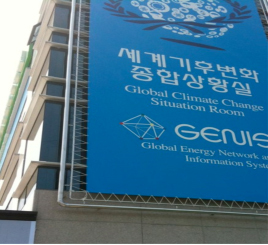 This is being adapted and expanded to serve the Global Climate Change Situation Room. The situation room will be available via the Internet as a global resource to help the United Nations, governments, business, NGOs, and individuals understand the global situation and future prospects for climate change.